It’s the end of the week. Already! Time sure flies when you’re having fun and there’s so much more I could share with you. 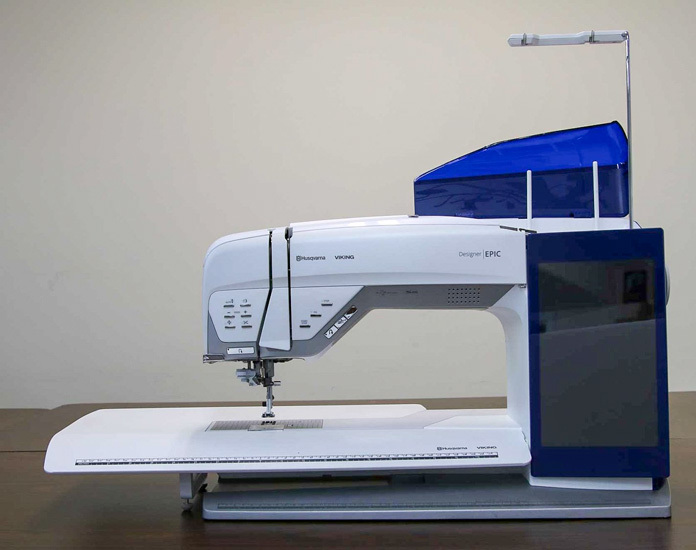 The more I dig into the capabilities of the Husqvarna Viking Designer EPIC, the more I want to sew. Reading through the User’s Guide, Quick Help and JoyOS Advisor built in the machine has my creative juices flowing. Before I get started, I thought I’d share this story with you. 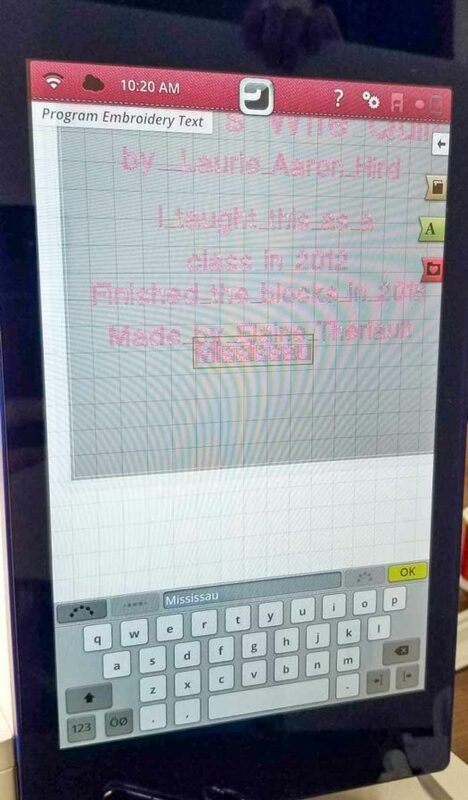 I love technology and for the most part, I’m pretty good with it. However, I was struggling to download the User’s Guide to my tablet. I did what I was supposed to do, but nothing happened. 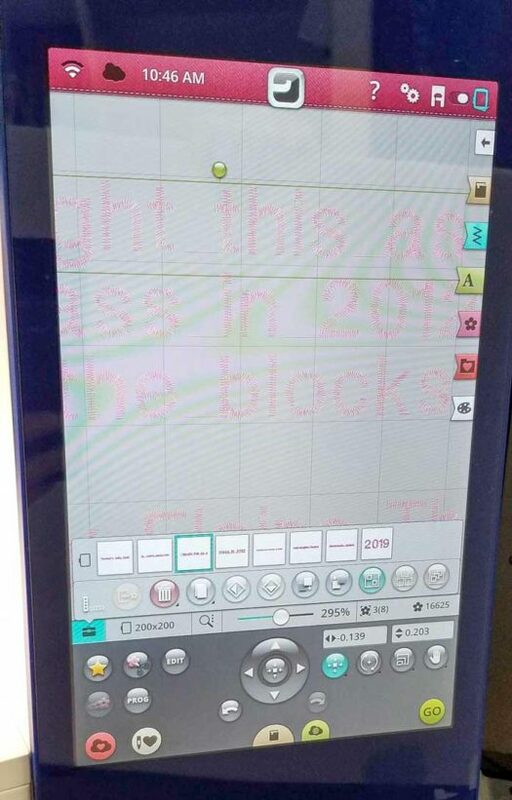 So I booked a service appointment (thankfully on the phone) with the tablet manufacturer. They called me on time. While the customer service rep was logging the call, I thought I would try to download the User’s Guide one more time. You guessed it – in a matter of seconds that file downloaded into the tablet. But now I have the User’s Guide on my tablet and I can reference it wherever or whenever I want. I’m excited about that. 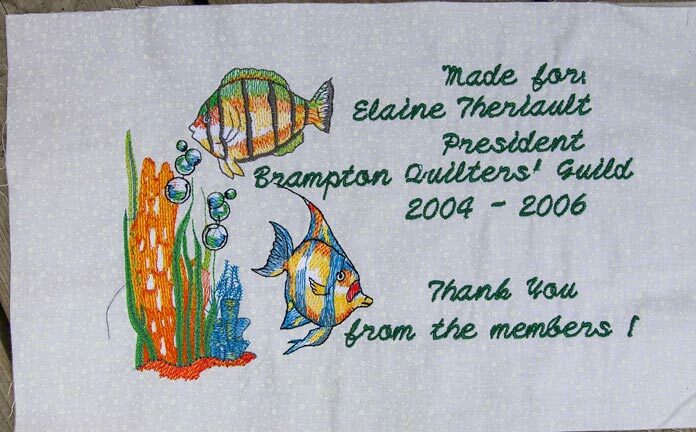 Today, I’ll make a quilt label using the embroidery functions of the Designer EPIC. I don’t normally make a quilt label until a quilt is finished and there was no quilt that was in need of a label. OK – I’m lying about that. I decided to make a label for one of the quilts that I made the sashings for earlier this week. There’s going to be a story about this label that’ll give you a smile. I started off with a piece of paper so I could make notes of what I wanted to include on the label. Not too much, but enough to let people know about the quilt when I’m not around to tell them. 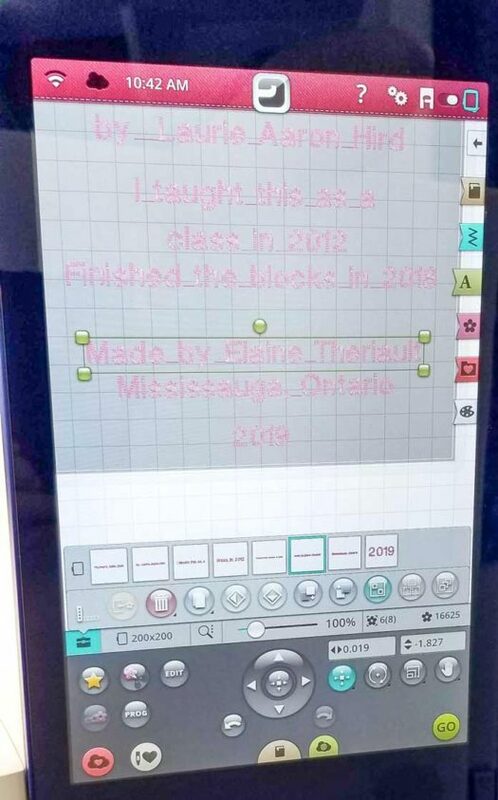 I started off with the name of the quilt, the designer’s name, a few lines about where and when the quilt was started and who made it, where and when. Once all that information was noted, I went to the Embroidery Edit screen. I started off by choosing the hoop size that I wanted to use – 200 x 200. Then I added in the lines of lettering. There are 9 lines in total. At this point, I didn’t really care how they looked on the edit screen. I just wanted the spelling to be correct and all the words included. Next up was to position the rows of lettering into a nice looking label. Since I still have the grid lines set at ½”, it’s easy for me to visualize how they’ll look when the label is stitched out. Remember that you can adjust the size of those grid lines depending on what you’re making. I was struggling a little bit with the positioning so I zoomed in to make it easier to see where the lines were positioned. I also used the positioning tools that are situated in the bottom right and also the big positioning wheel in the center of the bottom section of the screen. That made it much easier to position everything. 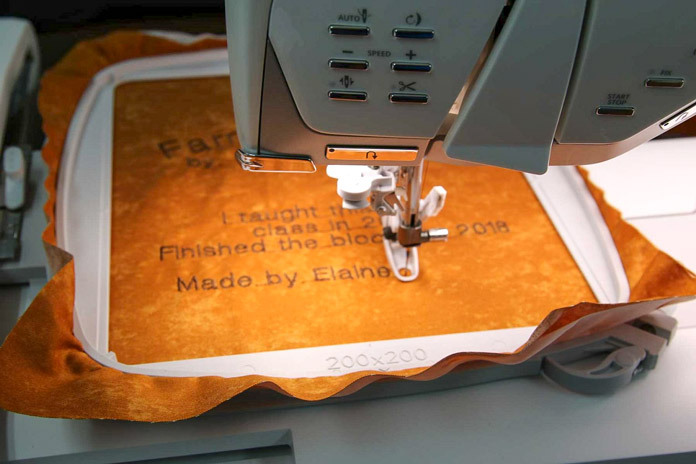 I love the flexibility of the tools and the Embroidery Edit screen. Before you hit GO, it’s not a bad idea to double check the spelling and the placement to ensure that everything is exactly as you want it to be. It would be bad to stitch out the label and spell your name or some other vital piece of information incorrectly. I also zoomed right out so that I could see the label as it would appear stitched out (smaller but you get the idea). Notice that I played around with the text shaping tool. It was easy and if I wasn’t sure of something, I looked it up in the User’s Guide and then I wasn’t afraid to play around on the screen. 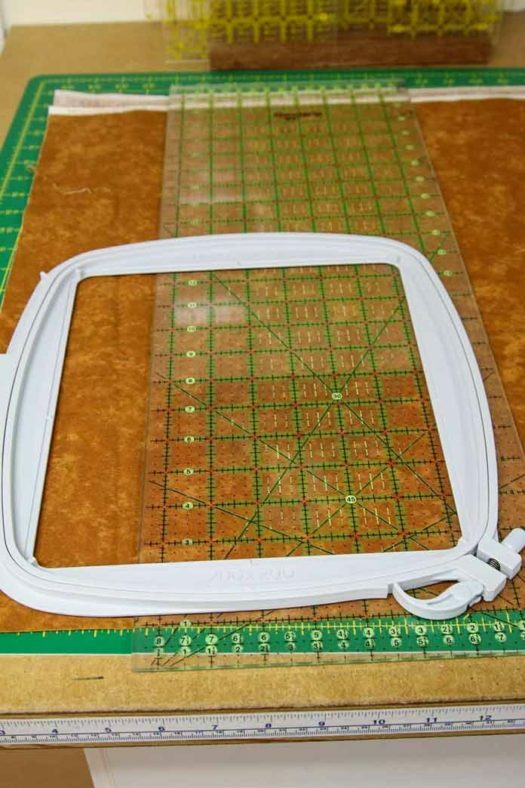 I used the 200 x 200 hoop as a guide as to how large to cut my piece of fabric for the label. It’s important that the fabric be larger than the hoop so the edges of the hoop can support the fabric. I cut a piece of stitch n tear stabilizer that was large enough to fit the hoop and hooped both the fabric and the stabilizer. Oh, notice in the picture above, the spring mechanism on the new hoops. That system is so much easier to close the hoops with than the screw from the one I used the other day. I’m not complaining as the old hoops work on the new embroidery machines and that’s a good thing. I use this hoop a LOT. I love it. Choosing a thread color won’t be as hard as it was earlier in the week. This time, I want that thread to have as much contrast as possible. 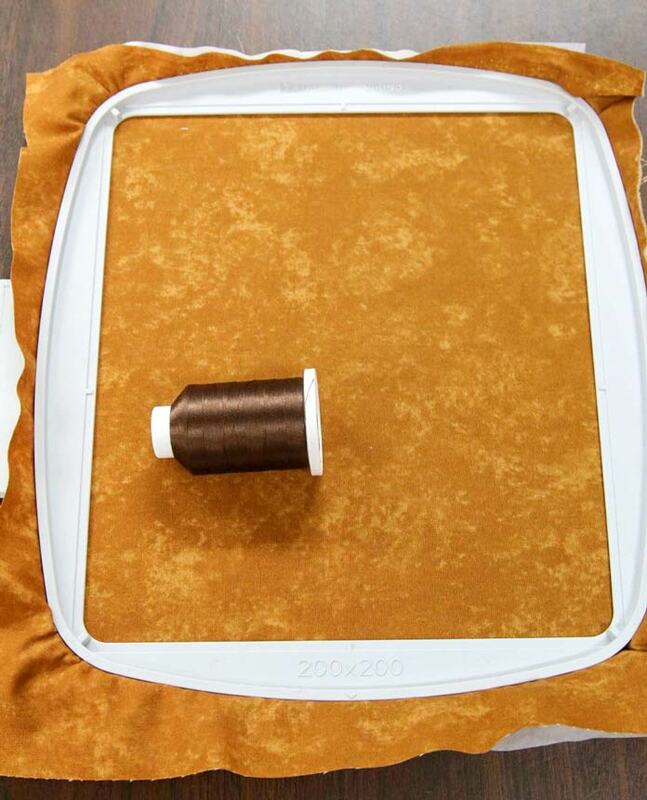 I think it’s easy to see that brown thread on that gold fabric will stand out. I used a brown bobbin weight thread in the bobbin. When I was in the Embroidery Edit screen, I had chosen the 200 x 200 hoop. 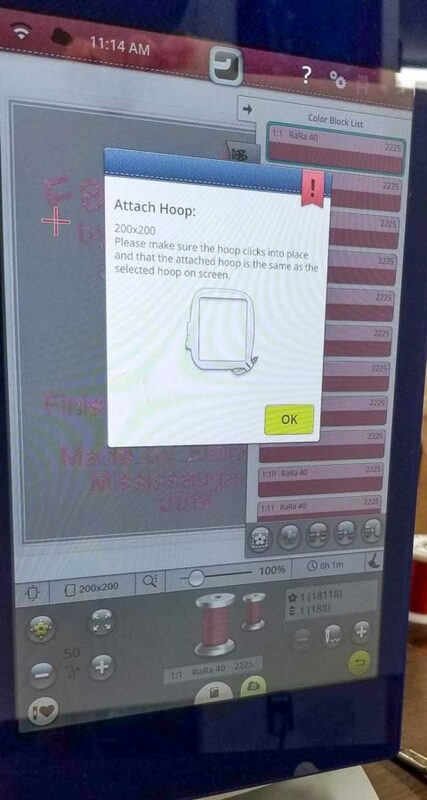 When I enter the Embroidery Stitch screen, the Designer EPIC asks me to attach the 200 x 200 hoop. It’s just another way of confirming that everything matches. Because my label consists of lettering that will be the same color, it’s important that I turn off the STOP function. I don’t want the embroidery machine to require attention after every letter. There are options to choose from to make the machine at certain points of the design (thread color changes). In my case, all the letters are the same color of thread so I’ll let it stitch out with no intervention. If you remember from the other day, you get a checklist when entering the Embroidery Stitch Out screen. One of the options is Thread Cut Options. 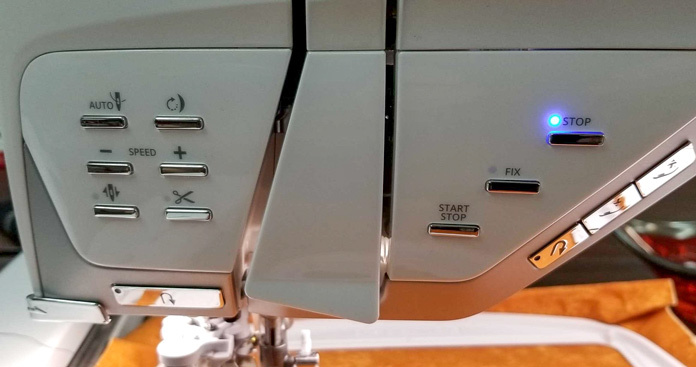 You can turn the Automatic Thread Cutter and Automatic Jump Stitch Trim on or off. You’ll notice in the final label that each letter is separate. There’s no thread connecting one to the other. 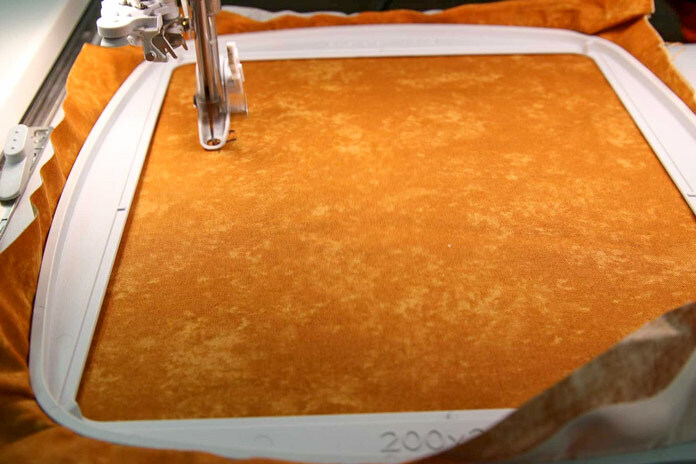 The Automatic Jump Stitch Trim was selected and that means that all the thread ends are pulled to the back of the work. This saves you a lot of time when the embroidery is complete. There’s no need to trim threads as the Designer EPIC did all that fiddly work for you. This option makes the final product look much neater as well. 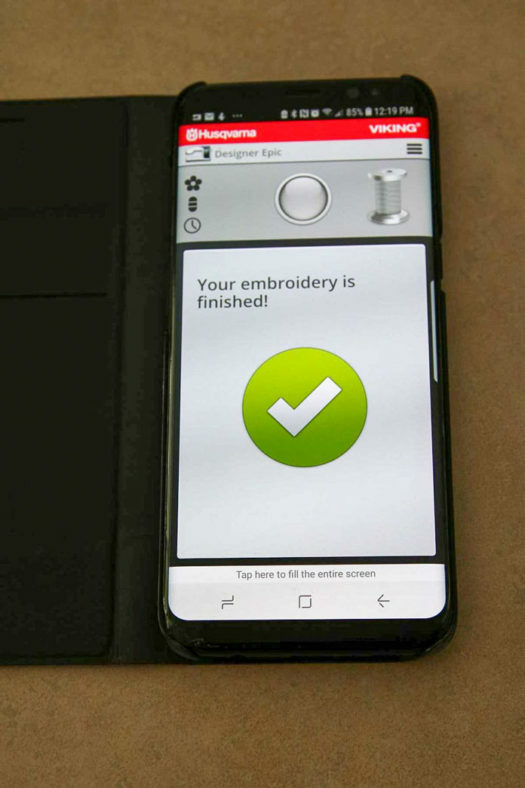 If you have your Smartphone and the Designer EPIC signed into mySewnet, you can use the app on your Smartphone to monitor the embroidery stitch out progress. 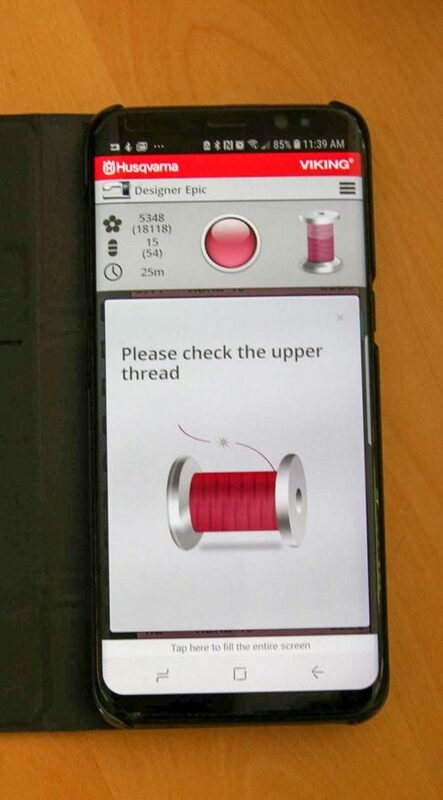 In the photo below, you can see that the Color Block List on the embroidery machine screen and my Smartphone match. 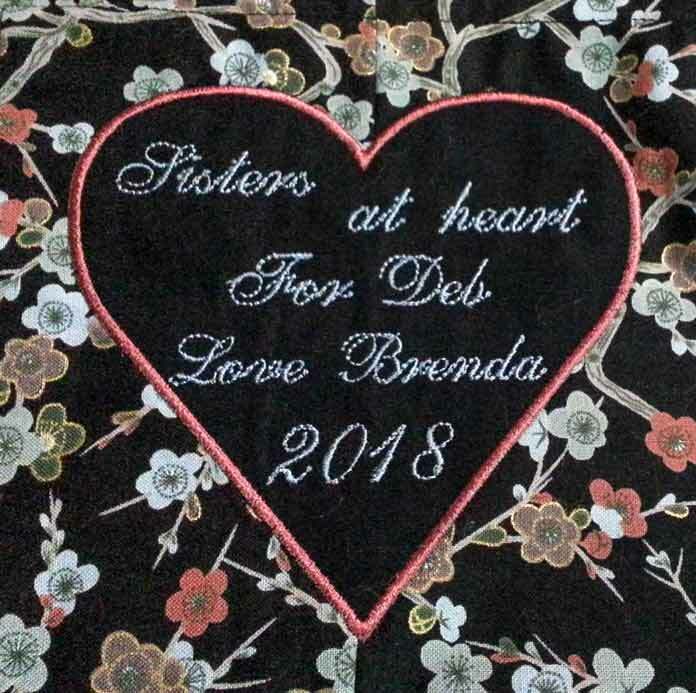 As long as you’re both connected to the internet, you’ll see the status of the embroidery stitch out. 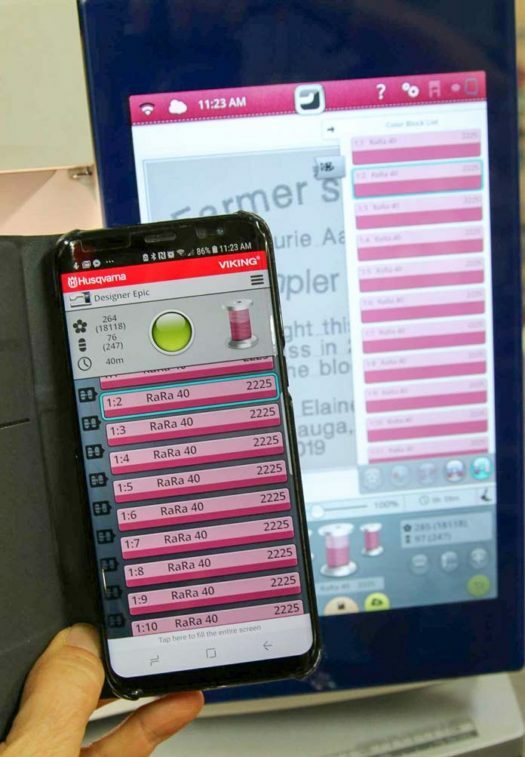 This is fabulous – love this technology. In this photo, I’ve just started the embroidery. Now I’ll go for lunch. Before I left the embroidery machine, you can see the monitor has moved to the second letter on the first row. In case you’re wondering what all those numbers mean; the first number is the row of stitching and the second number is the sequence of the specific letters. As I was enjoying my lunch, I got a notification on the Smartphone app to check the upper thread. I ran down to the studio and fixed the problem and back up to finish my sandwich. No need to hang my head over the railing to see if I could still hear the machine working. I LOVE that app! While we’re waiting for the Designer EPIC to finish stitching my label, I thought I’d share with you a couple of other labels. I didn’t make either of them, but hopefully, it’ll give you a couple of ideas for quilt labels. They can be fancy like this first one which includes a motif as well as the writing. Or they can be simple like this one which was appliqued to the backing before the quilt was quilted. Quilt labels do not need to be elaborate. While I could have checked my phone for the status of the label, I wanted to get a picture of the label in progress. You can see that it’s almost done. Then I got another notification on my phone. The embroidery is FINISHED! I ran downstairs to see that in fact the label was finished. That didn’t take as long as I had thought it would. Here’s the final label. I have to take it out of the hoop and tidy up the spaces between the words. A small task compared to having to remove all the jump stitches which the Designer EPIC did automatically! I love how the label turned out. Did you read the label? Did you notice the dates? 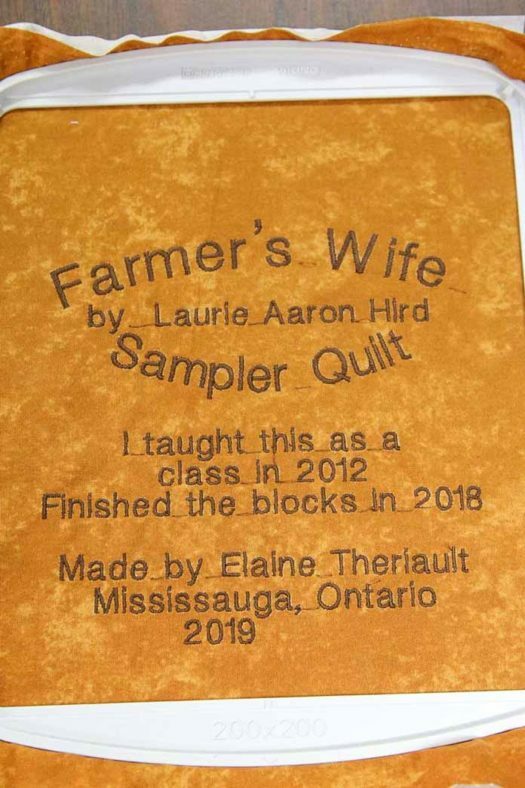 There is NO way that I’ll get that quilt finished this year so I put on the label that it was (will be) finished in 2019. I’ve given myself a bit of breathing space but how much do you want to bet that come December of 2019, I’ll be madly trying to finish that quilt? NO – I won’t let that happen. There you have it – a beautiful label that didn’t take long to make. The hardest part was deciding what to put on it. That concludes my week with the Husqvarna Viking Designer EPIC. It’s an awesome sewing/embroidery machine. The flexibility, the technology, and all the features make it an awesome machine. My head is spinning with the possibilities. I hope you enjoyed the posts this week and hope that you found some inspiration. QUILTsocial Giveaway 227: Fat Quarter Bundle of Rock City by Banyan Batiks! Thank you so much for this great idea! So much better than hand embroidering a label! I will put my embroidery machine to good use! 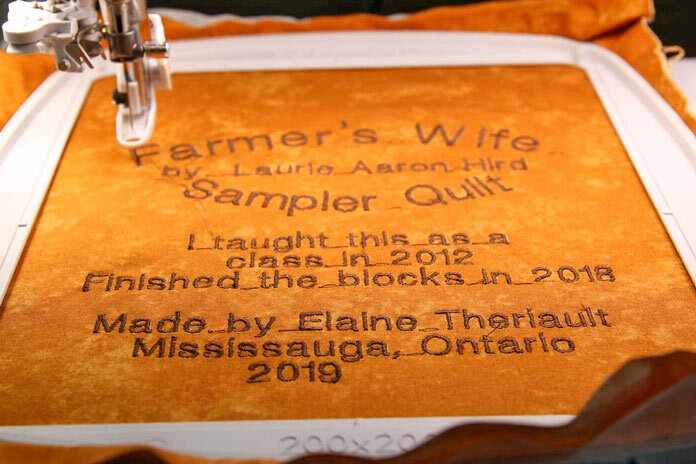 I love the idea of labelling quilts. I haven’t done it yet but plan on making this part of my projects from now on! Thanks for sharing projects on all these different machines. The next time I need to shop for a new machine I can look back at the many machines you have featured. Such great labels! 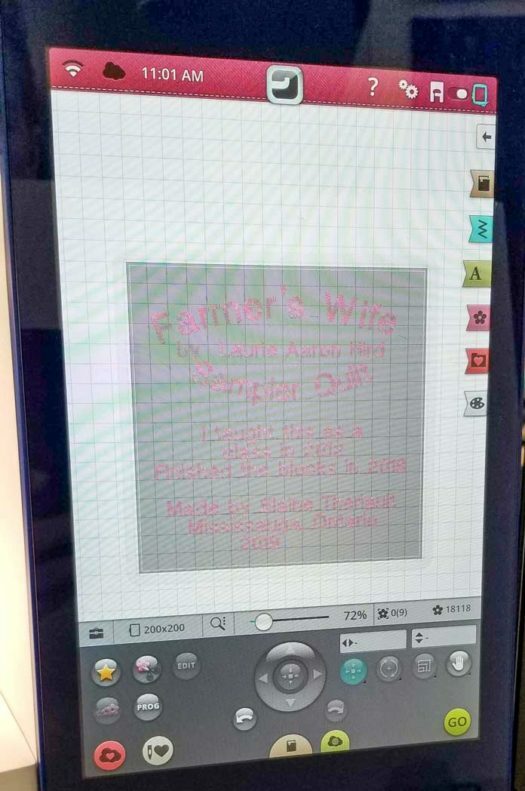 Love your sew monitor app. Thanks for the tutorial for making a quilt label! Wish I had this Dream Machine Epic.